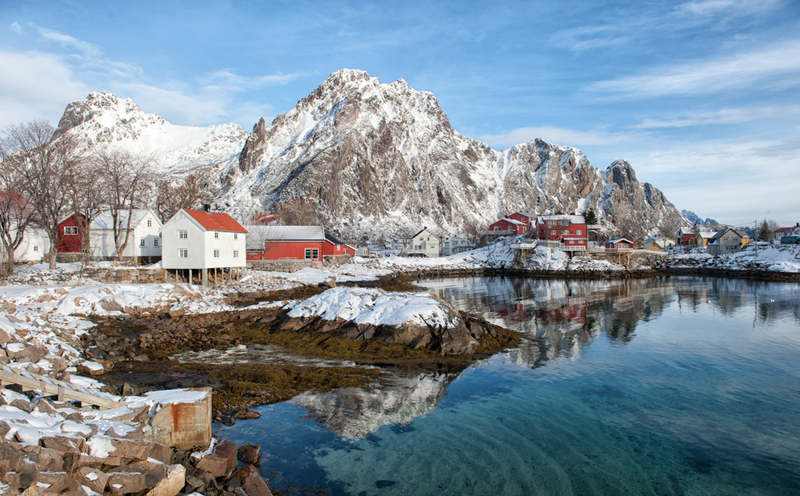 One of my strongest memories of the Lofoten Islands was not of the stunning fjords (which, with a fine coat of snow on them, were truly gorgeous) or even my decision to jump into the only-just-above-freezing water (after putting on two layers of thermals and a drysuit). Those sights and experiences were certainly unforgettable, but one of the things that stuck with me most was the islands’ smell. Surely somewhere as gorgeous as this would be remembered for its sights, not its sounds. Smell is the sense that often gets overlooked when recounting travel memories — unless the smell was truly awful. 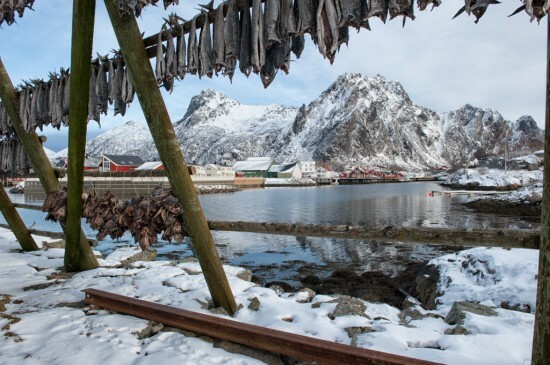 Travel stories don’t usually start with, “and I arrived at X and it smelled so great!” I certainly couldn’t describe the smell of Paris or Cologne (despite its namesake fragrance), but when I think of the Lofoten Islands, I instantly think of the ubiquitous stink of drying fish. Usually I’m not really a fan of rotten fish. I won’t lie — the smell hit me like a slap in the face when I stepped out of the car into the quiet night in Reine, one of the islands’ southernmost villages. 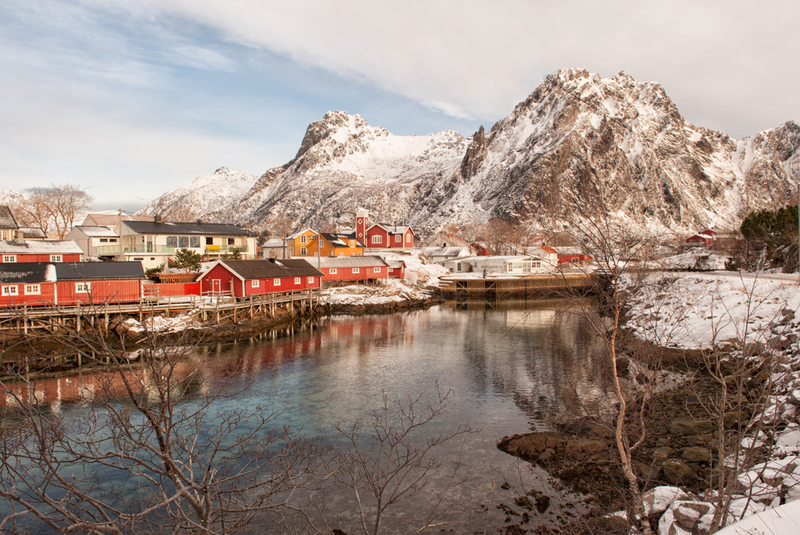 The smell wasn’t quite as ubiquitous in Svolvær, the capital of Lofoten, but it was still there, an undertone to every breath of fresh air I breathed in as I wandered around the town. …they make the smell pretty memorable. 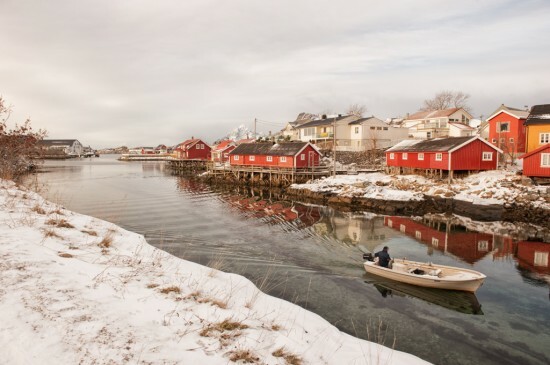 It shouldn’t be a surprise then when I say that the main occupation of those living in the islands is fishing — particularly cod fishing in the winter. 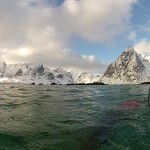 These fish, known as skrei in Norwegian, celebrate Christmas in the Barents Sea before making the long, cold trip south to spawn in the slightly more temperate waters of the Lofoten Islands. 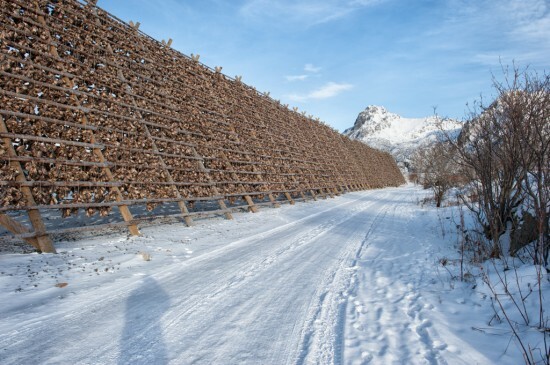 For many, it’s the last trip they will make before they get caught and hung out to try on hjell, the wooden racks that line the foreshore of many of the Lofoten fjords. 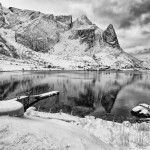 Not an uncommon view anywhere in Lofoten. A view of some of the other wooden racks on Svinøya. While much of the smell at my rorbu in Reine came from the nearby docks where fishermen offloaded their catch, the general smell of the islands comes from the hjell. 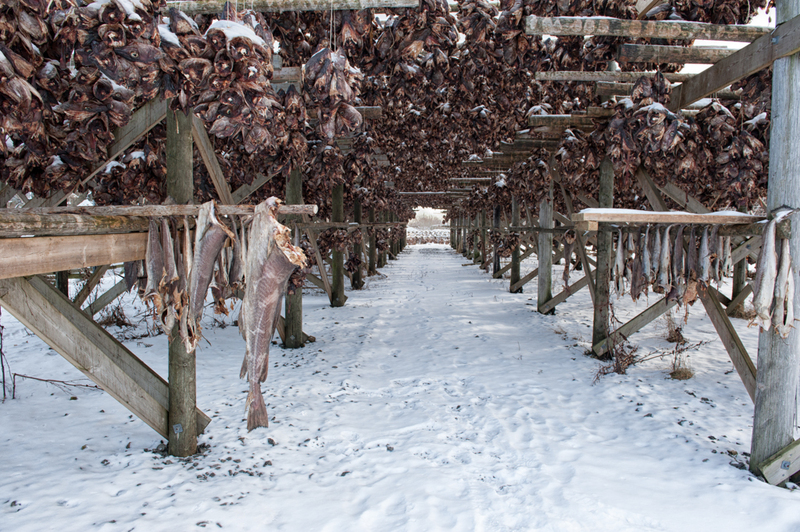 The climate in Lofoten is nearly perfect for the creation of stockfish — dried fish that is prepared here before being exported. 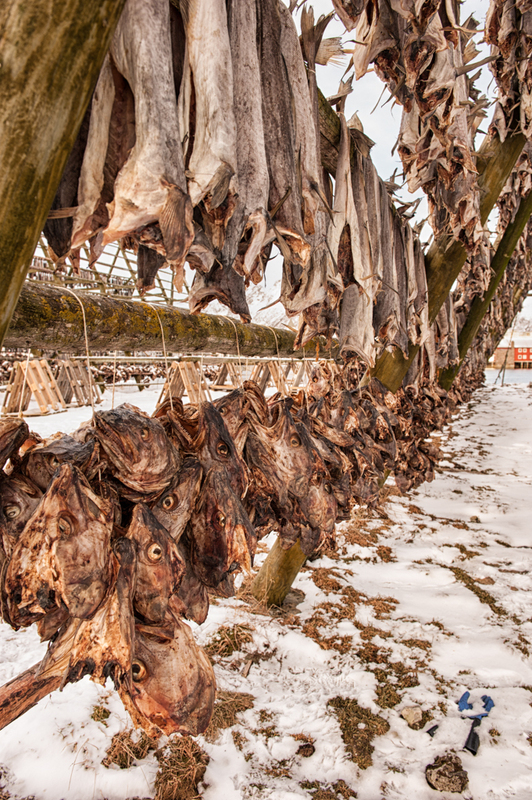 Temperatures that often hover around freezing (it was between -9ºC – 2ºC during my time there), allow the fish to hang out to dry for about three months without rotting or being completely frozen. 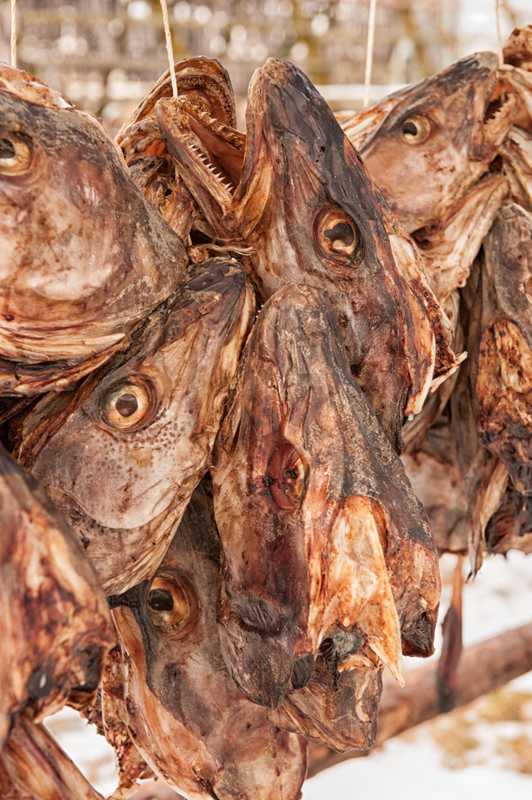 The thought of eating dried fish may turn your stomach, but like many foods you might not like the sound of, it’s considered a delicacy in some parts of the world. The Portuguese love dried cod (which goes under the name bacalao) and many places in Africa, after having been shipped dried cod from Norway through aid programs, are now huge consumers of stockfish heads. 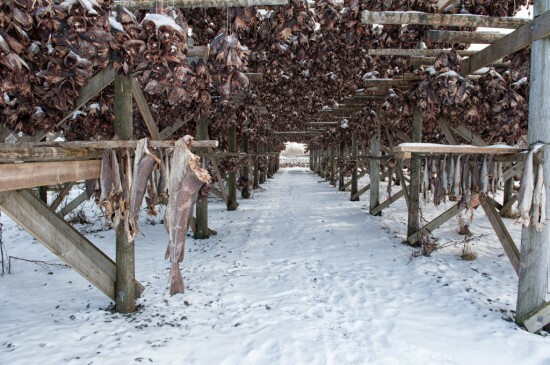 Still plenty more stockfish to add here! It’s no wonder that, when I talked to a local about the smell, she had quite a lot to say on the subject. Bente, the helpful live-in manager of the Kunstnerhuset hostel on Svolvær’s Svinøya Island, grew up in Lofoten and had watched the ups and downs of the industry through the years. 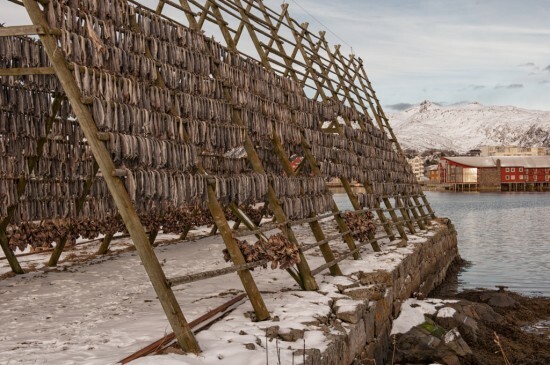 She was the one that told me about the new demand for stockfish heads from Africa — apparently, in the past, fishermen didn’t bother with drying the heads, but now they could be seen dangling from the bottom of every hjell. 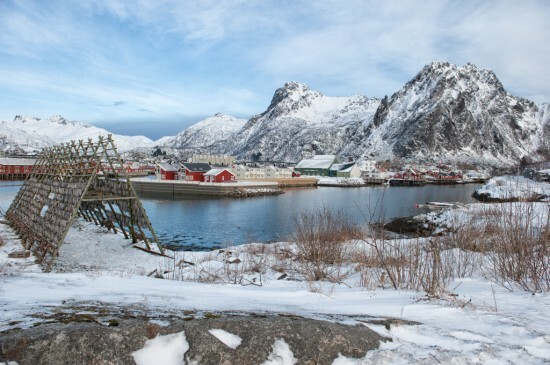 When I told Bente that I’d been to Reine without seeing a single rack full of stockfish — all the racks I’d seen on my wanders there had been empty — she was agast. She quickly directed me towards the end of Svinøya Island — seemingly the town’s fishing hub — and told me that it would be fine to walk in amongst the wooden racks there. The fishermen wouldn’t mind a few curious tourists wandering around…especially because, unlike the kids of Magerøya further to the north, they’re pretty unlikely to steal some dried fish for themselves! Stockfish pretty much as far as I could see. When we did notice the smell, we used to have a saying. It’s not the smell of fish — it’s the smell of money. Since I can’t send you that smell of money, I’ll part with a few other photos that bring that smell back to me every time I look at them. 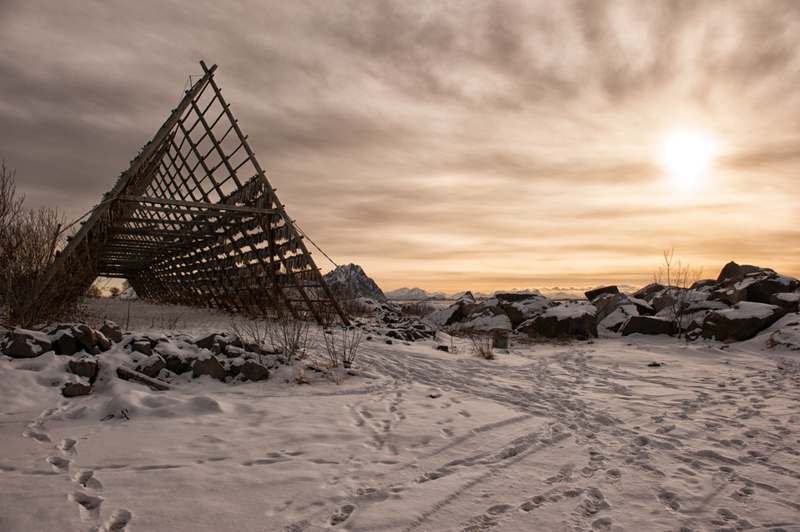 I really couldn’t have asked for a better morning to acquaint myself with the fisheries of Lofoten either, especially because the weak Arctic sun made the sky look like a brilliant sunrise all morning! 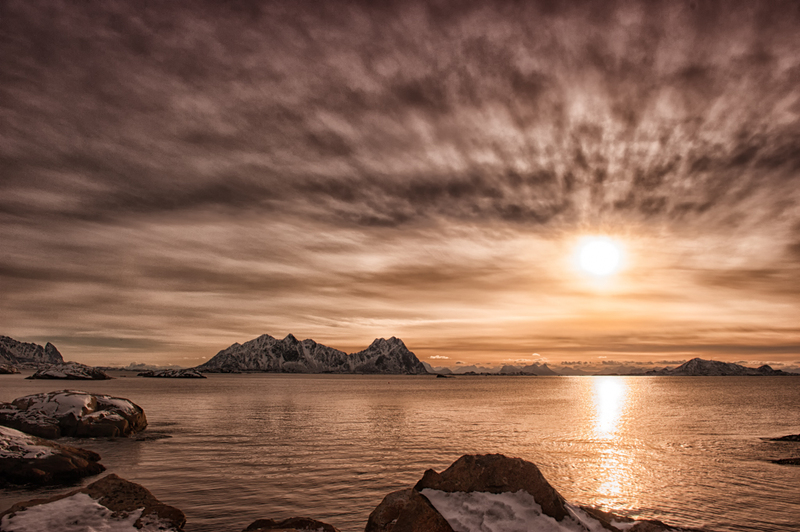 It looks like a sunrise over a hjell…but it was actually past 10am! 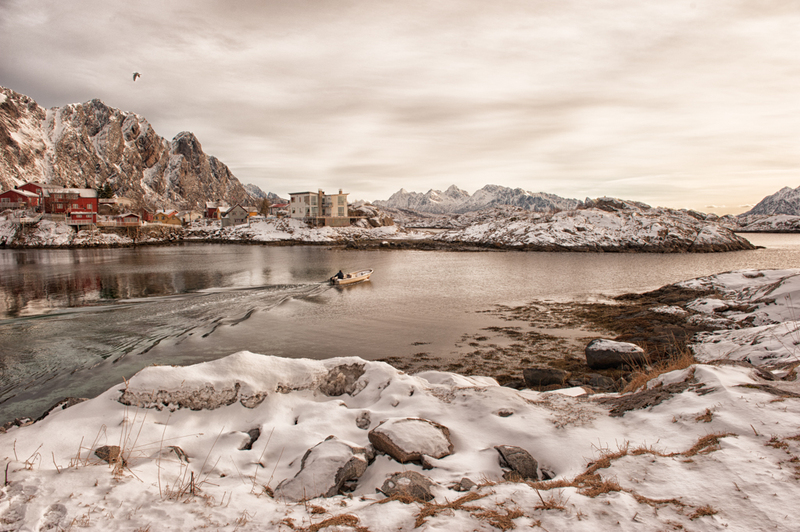 A fisherman passes by on his way out to sea. A lone fisherman heads out to sea. Is he getting ready for the World Championships of Cod Fishing? As much as I talked about the smell, the view was kind of worth looking at — even through the stockfish racks! 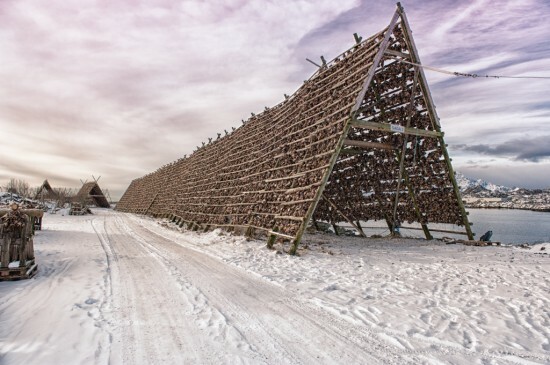 …and next to the stockfish racks too. But sometimes it was nice to look at the view — and the emerald green water of the fjords — without any fish in the way! 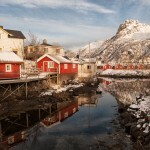 When you’re in Lofoten, I recommend visiting some of the villages outside of Svolvær and staying in rorbuer. 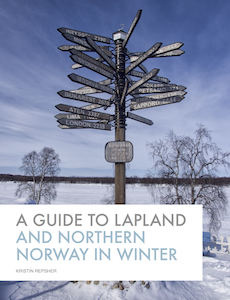 You won’t regret getting out of the “big city” and seeing what life in some of the sleepier villages is like. 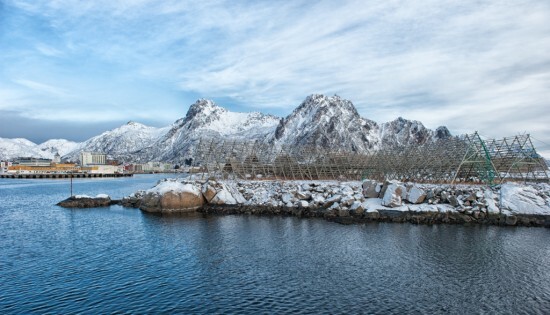 Svolvær hosts the World Championship in Cod Fishing every year in March. 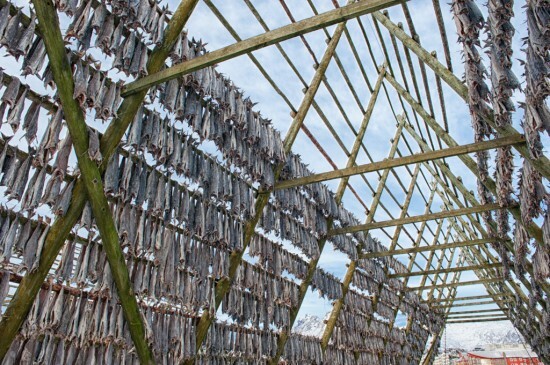 If you want to see how much people really love cod fishing, this would be the weekend to visit — but I was warned that the entire town had booked out well in advance, so you’ll want to plan early. Oh. My. God. 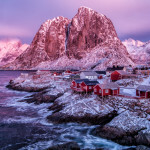 Kristin, your photos are stunning! Stunning, stunning, stunning! Thank you Deb — your comment definitely put a smile on my face! I really enjoyed processing the photos for this post — although it was difficult to pick out my favourites from the massive number of photos I took that day!